Explore the French Riviera with AESU! Along the southeast coast of Provence, where the Alps meet the Italian border and the Meditteranean Sea, lies a captivating destination known as the French Riviera. With mild winters and warm summers, the French Riviera (or Cote d’Azur) attracts millions of visitors each year. From ancient villas to charming vistas, discover the highlights of the French Riviera! Monaco, a sovereign municipality ruled by the Grimaldi family, is often referred to as a playground for the rich and famous. In fact, Monaco holds the first rank of the world’s richest inhabitants in terms of GDP per capita. 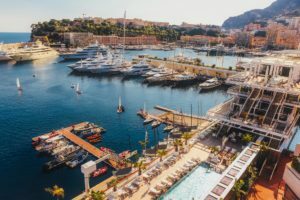 Stay at the luxurious Hôtel Hermitage Monte-Carlo, place your bets at the Monte Carlo Casino, and gaze at superyachts in the sparkling harbor. Fans of auto racing won’t want to miss the 77th annual Monaco Grand Prix on May 26! The prominent Formula 1 race is expected to attract more than four million spectators this year. Villefranche-sur-Mer is located near the French-Italian border, just a short drive from Monaco. Although it might not be considered as glamorous as Monaco, the Niçoise fishing village is perhaps the most charming destination in all of the Cote d’Azur. Red, orange, and pink buildings line the entirety of a large hillside overlooking the harbor. Enjoy an aperitif at an outdoor cafe, wander through the narrow cobblestone alleyways, and dip your toes into the warm Mediterranean. Preparations are already underway in Cannes for the 72nd annual Cannes Film Festival (May 14 to May 25). The world’s most famous celebrities will flock to the French Riviera for a week of international celebration. The film festival isn’t the only reason to visit this alluring French city. Explore the boutiques during the afternoon and capture the perfect sunset along the Promenade de la Croisette. You don’t have to purchase a new Chanel bag to appreciate the unforgettable, distinctive beauty of Cannes. Enjoy a free day on the dazzling French Riviera on the Cosmopolitan Tour! Relax on the beach, paddle in the azure sea, or sip on a smooth cocktail beneath swaying palms. Check out the day-by-day itinerary, and give us a call for more information! 2019 tour dates and prices are available and selling out quickly! If you have any questions or want help booking your European adventure, please contact AESU by calling 800-638-7640, or fill out the contact form found on our website. Follow AESU on Facebook, Twitter, LinkedIn, and Pinterest. This entry was posted on Wednesday, April 17th, 2019	at 10:21 am	. You can follow any responses to this entry through the RSS 2.0	feed. You can leave a response, or trackback from your own site.